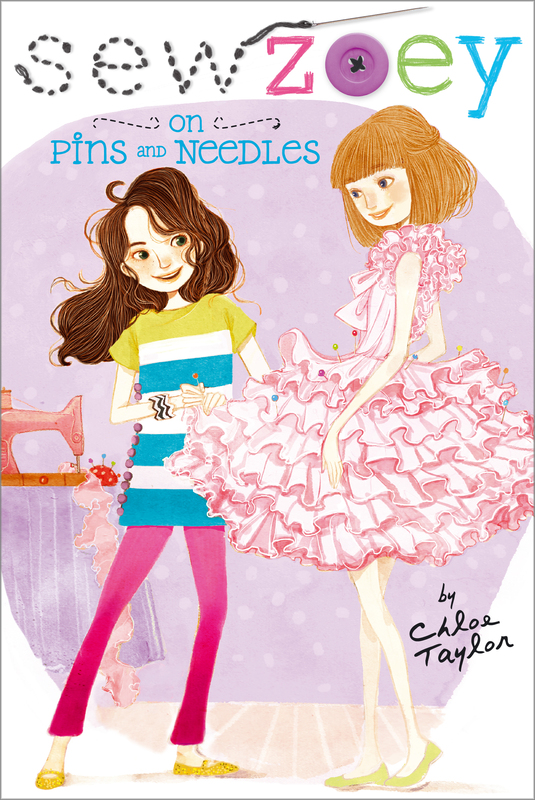 As Zoey prepares for a sewing contest, she realizes her friendships are also in need of tailoring. In the second book in the Sew Zoey series, things are going great for Zoey on the fashion front: She meets a real designer who tells her she should enter a big sewing contest, and she finds out that her idol, Daphne Shaw, is a fan of her blog! But off the runway, Zoey’s having friend trouble times two. First her best friend Kate gets her braces off—and starts getting a lot of attention from boys, including Zoey’s crush, Lorenzo. Is she still the same sweet Kate on the inside? Then Zoey’s newest friend, Libby, thinks Zoey is friends with her only because her aunt is one of the contest judges. Zoey thought fashion emergencies were tough…but compared to friendship emergencies, they’re a cinch. How can she prove that she’s friends with Libby for the right reasons and fix her relationship with Kate? In a way that is totally Zoey! Three guesses where I’m going today—and the first two don’t count. The Eastern State University football game, you say? Congratulations! You are right! And, no, I am not wearing this “pom-pom dress.” It’s what I wish the ESU cheerleaders could be wearing instead of the same old uniforms they’ve been sporting ever since I’ve been going to their games. And that’s . . . let’s see . . . If I’m twelve years old . . . that means twelve years, approximately. That probably sounds like I’m a huge, crazy football fan, doesn’t it? But I’m not really, so let me explain. If my dad didn’t work at ESU as a physical therapist for all the sports teams, trust me, I’d be at home sewing and sketching (and blogging!) on Saturdays instead of watching a football game—or basketball or baseball . . . You name it and we’re there. It’s not so bad, though, when my friends Kate and Priti come with me, which they are today. Hooray! If you’re there, look for us. I’ll be the one with the sketchbook—because you never know when inspiration will hit! Oh, and I’ll be wearing the top that I finally finished, which I blogged about yesterday. Some might think it’s a little fancy for a football game, but I think it’s just too cute not to wear right away. Too bad I didn’t make it Eagles colors—purple and yellow. Hmm. Those colors look pretty good together. Something to think about . . . ! “Here it comes! Here it comes!” said Priti Holbrooke. She pointed to the end of the football field. “I see it.” Zoey Webber leaned forward and perched on the edge of the metal seat. On her other side was Kate Mackey, whose big blue eyes were focused on the game. Zoey nudged her. “It’s coming. Get ready,” she said. “What?” Kate turned to look. “Again?” She groaned, but she was smiling as she leaned forward as well. A second later, the wave reached them. They stood and threw their arms into the air: Kate’s long, tan ones; Zoey’s pale, freckled ones; and Priti’s, which were cinnamon brown. “Whooo!” Zoey yelled—not quite as loud as Priti, but close—then they all sat back down and watched the wave continue around. Suddenly, the crowd jumped back up and an even louder cry rang out. Zoey looked down to see the whole ESU team celebrating what must have been an exciting touchdown. “Oh! I missed it!” cried Kate. She shook her head in disbelief. Zoey rubbed Kate’s shoulder. “Sorry,” she said. Kate took sports very seriously, and since Zoey took fashion very seriously, she knew how she must feel. Not as bad, of course, as Zoey had felt when the dress she’d designed and sewn for their school’s fashion show was mysteriously ruined by yellow paint. More like when she realized she’d mixed up the sleeves on the top she was wearing that day. She’d almost cried when she had to rip them out and start all over again. In the end, though, it turned out fine. Better than she’d hoped. The top was supersimple . . . looking. Basically, a loose-fitting tee. The fabric, though, was a fabulous blue-and-green pattern for the bodice and a magenta-and-gold one for the sleeves. “Don’t worry, they’ll do it again,” she told Kate. “Let’s hope so,” Kate said as she looked at the scoreboard, which now read: VISITORS 21, ESU EAGLES 6. By halftime the wave count was twenty. The score hadn’t changed. And Zoey was getting hungry. It seemed like way more than two hours since she’d had lunch at home with her dad. “Snack bar?” she asked her friends, who each instantly jumped up. “You read my mind! I’m starving,” said Kate, already scooting toward the aisle. Zoey stopped in front of her dad, who’d been sitting behind them with friends from work. They were all wearing ESU caps, which were purple with gold letters across the front. Only her dad had on The Tie, though, which he always wore for good luck. It was bright purple with gold winking eagles, and frankly it made Zoey’s eyes hurt. Zoey loved her dad more than anything . . . but he was style challenged, to say the least. She sometimes wondered if her mom were alive, would he have still worn the things he did? Zoey was too young when her mom died to remember her well, but everyone still talked about her style and how chic she always looked. In fact, Zoey wondered a lot of things about what having her mom would be like. “Hey, Dad? Okay if we go get some popcorn?” she called to him. Zoey held out her hand and opened and closed it, the international sign for Money, please. “Thank you!” she said as he handed her a bill. “Yeah, thanks, Mr. Webber!” Priti and Kate chimed in. Together, they hurried down the bleacher steps to the nearest snack bar. The air smelled of salty popcorn and greasy hot dogs, and the line was already long. Zoey read the menu to see what else they might want . . . .
Kate made a face, and so did Priti, and Zoey quickly remembered why. Both of her friends had braces, which made gummy bears—and a million other things—almost impossible to eat. Kate had been the first one to get them, and Zoey still remembered how jealous she’d been. “Why can’t I get braces?” she’d asked her dad again and again. “Because you don’t need them,” he’d told her proudly. “You have straight teeth—like your mom.” Personally, Zoey would rather have gotten her mom’s strawberry-blonde hair instead of the wavy brown stuff she got from her dad. But she also knew now that braces weren’t half as much fun as she’d thought they were when she was ten. “Oh right.” Priti nodded this time. “Of course. Silly me.” She started to smile at Zoey, but Zoey had to look away. She knew if her eyes met Priti’s right then, she could easily blow their surprise for Kate. “You know, it’s too bad Libby couldn’t come,” Zoey said, since changing the subject seemed like a good idea. Plus, she really was sorry their newest friend from school wasn’t there with them too. Libby was new to Mapleton Prep. She’d just moved to town. And she was one of several happy surprises middle school had brought to Zoey that year. Another was something Zoey had actually petitioned for the year before: For the first time in sixty-five years, no more school uniforms! Now, instead of pleated skirts and ties, students could wear (practically) anything at all, and Zoey was already making the most of the new and much-improved dress code. Zoey wanted her clothes to say something distinctive about herself. She also believed that clothes were fun—not just to wear, but to design. Over the summer, she started sketching all kinds of cool dresses and outfits, though it was a hobby she’d kept to herself. And then one day she showed Kate and Priti—her bestest and oldest friends—and, well, they went kind of crazy over all of them. It was their idea, in fact, for Zoey to put her sketches into her very own fashion blog. And now Sew Zoey had hundreds of followers . . . which was definitely the most surprising surprise of the fall. And every time she looked at the ticker counting visitors to the blog, it was moving ahead. The line for the concession stand, meanwhile, was barely moving at all. “Where’s Libby, anyway?” Priti asked. “Remember? Her aunt is visiting this weekend,” Zoey said. “But I told her there’d be lots more chances to come to a game with us, if my dad has anything to do with it.” She laughed. “And Marcus? I thought he was a big fan?” asked Kate. “Band practice,” Zoey replied. Her brother was sixteen years old and played drums in a band with his friends. They were pretty good but only knew a few songs from start to finish. “I don’t know about you, but I’m happy it’s just us. It’s kind of nice,” said Kate. “Group hug!” yelled Priti as she pulled Kate and Zoey in for a squeeze. The three girls were still laughing as the line moved up. At last they got to the counter, and Zoey ordered two popcorns and a drink. “Oh, and a cotton candy,” she added. Priti shook her head, and Zoey did as well. Zoey slipped her change in her pocket and watched Kate walk off. “She’s going to love our surprise!” she said, turning to Priti. “I can’t wait until Monday! Oh wait, Tuesday, I guess.” That was the day they’d give Kate a gift to celebrate her newly straightened teeth: a “bye-bye braces” lunch bag filled with the things she’d been missing so much for the past two years. Cecily Chen was a young designer, but she was becoming famous very fast. She’d been a judge on Fashion Showdown and dressed Kate Middleton several times. Her style was distinctive but always evolving. That season, she was into warm colors and layered pieces that looked effortless, but that were actually pretty complicated to make. But what made Zoey most excited by her was the fact that she’d grown up just two towns away. According to Jan, who owned the fabric store called A Stitch in Time, the designer had shopped in her store all the time until she got her big break and moved to New York. It gave Zoey a little thrill from then on, whenever she walked through the heavy glass doors. I’m walking in a famous designer’s footsteps! “So Kate’s not coming?” asked Priti. “Ooh! That’s going to be good! Promise you’ll make me one too, when my braces come off,” she begged. “Of course!” Zoey told her. “I’m back,” Kate said suddenly. Zoey and Priti both looked up from Zoey’s open sketchbook to see Kate standing there, smiling at them. “The line was way too long. What’re you looking at?” she asked.